The Old School House is a most attractive four bedroom detached period house situated in the rural hamlet of Stowell. This former primary school has been sympathetically extended to provide an individual and very charming home with generous living accommodation. There is a light and airy sitting room with contemporary LPG stove, dining room with polished wood flooring, fitted kitchen, downstairs shower room, master bedroom with en-suite shower, detached garage and an attractive private garden. LOCATION: The Old School House occupies a peaceful position in the centre of Stowell which is a favoured settlements in the area surrounded by rolling countryside. Local facilities are available at Charlton Horethorne with a primary school, parish church, village store, post office and inn/restaurant. A wider range of facilities are available in Milborne Port including various shops, two inns, a primary school, garage, filling station and social club. The old Abbey town of Sherborne is within 5 miles with two large supermarkets (Waitrose and Sainsbury’s), specialist shops, well known schools and many cultural facilities. Wincanton (approximately 6 miles) has a good range of facilities including Morrisons, LIDL and a large Co-op. Main line stations are at Sherborne and Templecombe (approximately 1.5 miles). ENTRANCE HALL: Radiator and stairs to first floor. 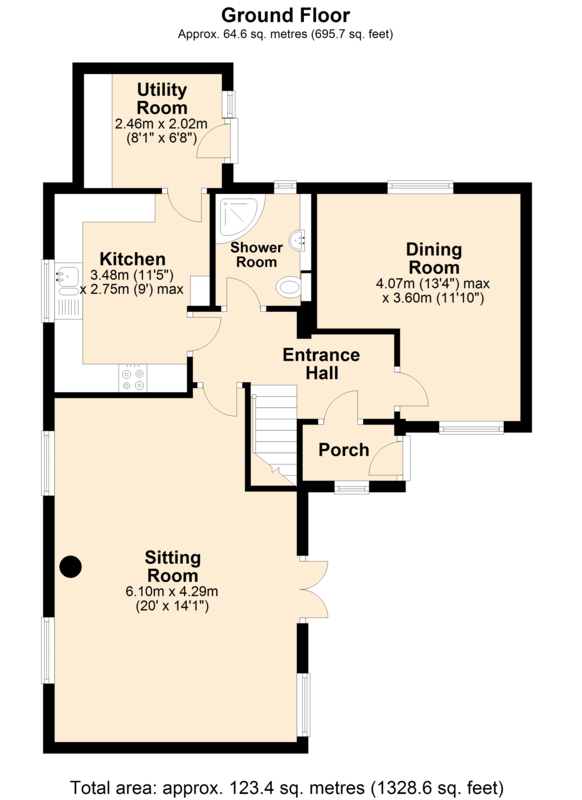 DINING ROOM: 13’4” x 11’10” (narrowing to 8’1”) Radiator, exposed floorboards and dual aspect double glazed windows. UTILITY ROOM: 6’8” x 8’1” Fitted wall units, broom cupboard, working surface, tiled floor, oil fired boiler, double glazed window and door to garden. SHOWER ROOM: Corner shower cubicle, low level WC, semi-recess wash hand basin, tiled floor, extractor, fully tiled walls, heated towel rail and extractor. GALLERIED LANDING: Radiator, double glazed windows to front aspect, hatch to loft, exposed ceiling beam and airing cupboard housing hot water tank with shelves for linen. EN-SUITE SHOWER ROOM: Corner shower cubicle, low level WC, wash hand basin, heated towel rail, fully tiled walls and extractor. BEDROOM 2: 13’2” x 9’9” (max) Radiator, dual aspect double glazed windows, wall light points and wall to wall fitted wardrobes. BEDROOM 3: 12’1” x 8’2” (narrowing to 7’8”) Radiator, double glazed window with countryside views and exposed ceiling beam. BEDROOM 4: 8’2” x 7’8” Radiator, built-in wardrobe, double glazed window with a rural outlook and exposed ceiling beam. 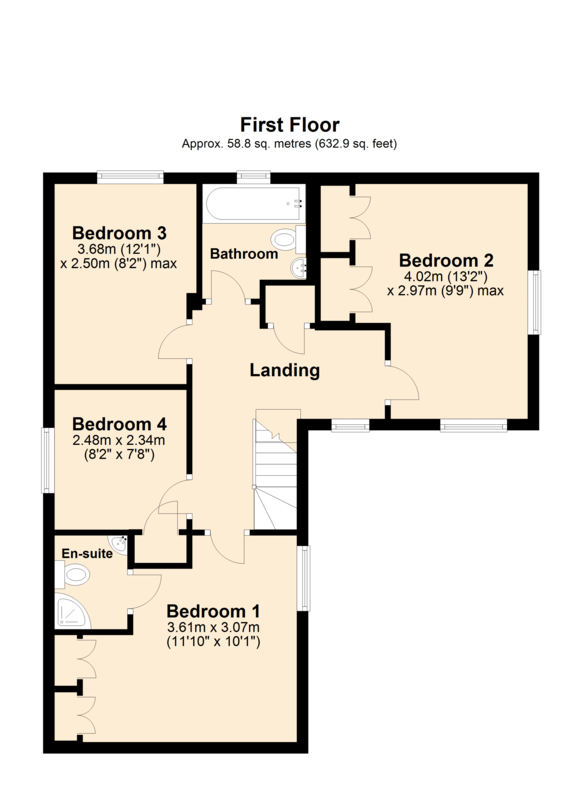 BATHROOM: Panelled bath, pedestal wash hand basin, low level WC, fully tiled walls, heated towel rail, exposed beam and double glazed window. The Old School House is approached from the village via a double timber gate leading to the on-site parking area and detached garage of matching construction with up and over door, light and power. The garden which lies to the side of the house measures 45’ x 35’ and is arranged with level lawn and well stocked raised flower and shrub borders together with a timber garden shed. SERVICES: Mains water, electricity, private drainage, oil fired central heating and telephone all subject to the usual utility regulations.